Rekolan Sekakuoro is a big mixed choir (SATB). The choir was founded in 1952 in the Rural Municipality of Helsinki (today VANTAA) and registered in 1953. Since autumn 2014 the choir has been conducted by Master of Arts Jaana Raivio. Starting autumn 2016 the choir will be conducted by Anu Pulkkinen. The choir has about 50 members; students, singers in working-age, pensioners. The choir performs actively. In 2015 there will be altogether 15 concerts; Kaustinen folk music festival, spring and christmas concerts, concert in Tallinn together with local Riola-choir, various events in Vantaa, co-operation with Rekola parish. 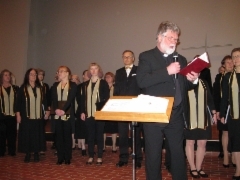 The choir has a wide repertoire of modern and traditional choral songs and Finnish popular music. Rekolan Sekakuoro is a part of the music courses of Vantaa Adult Education Institute.